Women’s no. 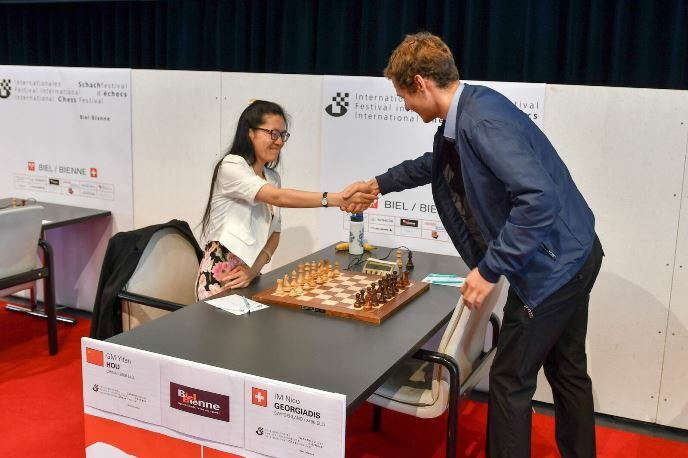 1 Hou Yifan won her last three games to take clear first place in Biel, becoming the first woman to win the top prize in the Biel Chess Festival’s 50-year history. Her 2809 performance featured five wins and a tactical shot that will become an instant classic. 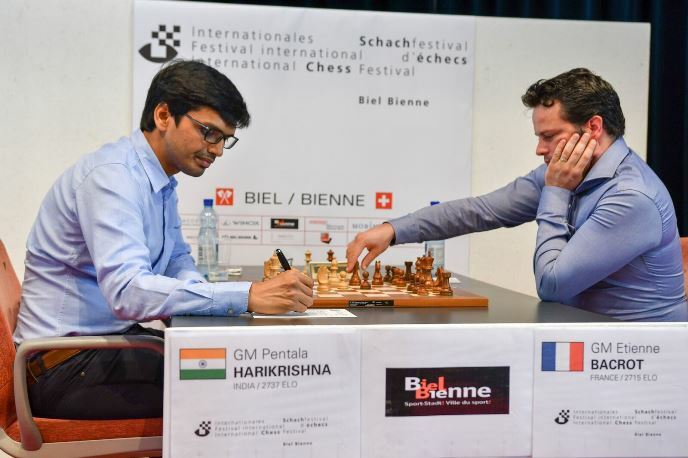 Second place was taken by Etienne Bacrot, who in the final round inflicted the first defeat of the tournament on Harikrishna. The Indian Grandmaster had to settle for 3rd place. 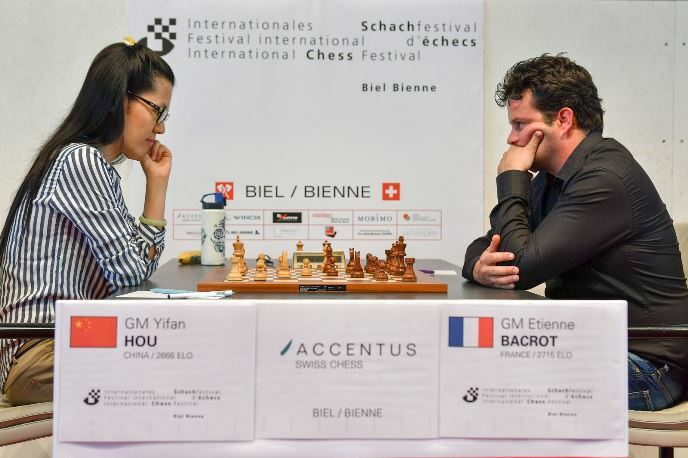 When we last reported on Biel on the rest day Hou Yifan was half a point behind Etienne Bacrot in clear second place. In Round 6 her hopes of tournament victory suffered a huge blow when she lost a tricky queen + rook position to Harikrishna, but it turned out that was just a temporary setback before a storming final three rounds! 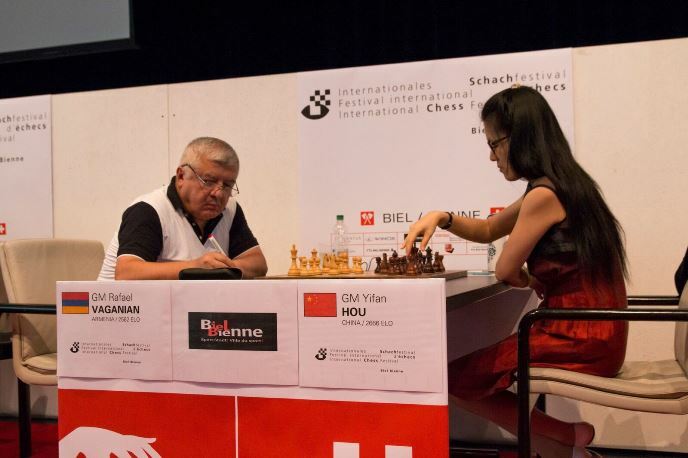 This was the result that blew the tournament wide open, with Hou Yifan beating the leader, who up to this point had three wins and three draws. 36.Re5! won the game, since there’s nothing to do about the threat of 37.Rg5, winning the queen. If the black king ventures to the f-file White can simply take the bishop on e6, if it goes to the h-file 37.Rh5+ would force it back, or White can also win the rook with 37.Qh4+. That same idea is the reason 35…Rd8 was a blunder, since the otherwise saving 36...Qh7 is met by 37.Qg5+!, winning the d8-rook. Etienne resigned. 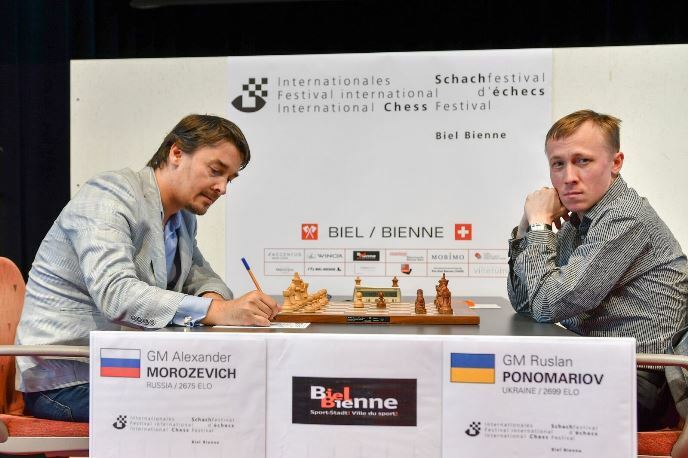 In the same round Alexander Morozevich beat Ruslan Ponomariov to hurt the Ukrainian’s challenge and boost his own. The Chinese star was eagle-eyed enough to spot 20…Bxg2!! 21.Kxg2 Qxd4!! and now 22.exd4 would have allowed Yifan to demonstrate the point: 22…Nf4+!, winning back the queen. Rafael Vaganian is a chess legend and tried to mix things up with 22.Qxg6 but the response was flawless: 22…Qd5+ 23.e4 fxe4 24.Qxe4 Qg5+ 25. Kh1 Qxd2. Vaganian was temporarily able to harass the black king, but the extra exchange proved decisive. 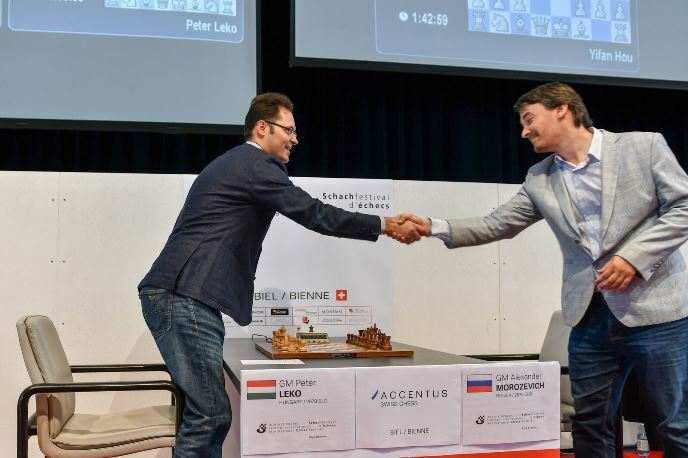 Morozevich won again to move into touching distance before the final round, while Harikrishna beat Ponomariov to join Hou Yifan in the lead on 5.5/9. All five games were decisive on a thrilling last day, which went wrong fast for Harikrishna when he played the calamitous 21.Bc5?? White would live to fight another day if the black rook moved, but Etienne played the winning 21…Bxf5!, when the misplaced bishop means 22.Qxf5 loses instantly to 22…Rd5. In the game we got to see the problem with 22.Nxf5, which ran into 22…Qh2+ 23.Kf1 Rd2! and Black had a ferocious attack without the need to invest any material. Given the tournament situation Hari played on, but it was a forlorn struggle. Nico ignored the positional threat and played 15…Ba6? !, a move that would have been strong one move earlier, but now allowed 16.Bxc5! dxc5 after which it was just a question of whether White would win or draw. From that point on the women’s no. 1 was imperious, and exploited her opponent’s inaccuracies to win a pawn and soon the game. She’d done it! Elsewhere Peter Leko ended a very mixed tournament on a high by grinding out a win against Alexander Morozevich in 66 moves and many hours, while Ponomariov joined him on +1 by beating the luckless Noel Studer. The story, though, was all about Hou Yifan! Her result was one of the best ever achieved by a female player, with Judit Polgar’s joint 1st with Shakhriyar Mamedyarov in the 2006 Essent Chess Tournament one of the last comparable results (she twice beat then world no. 1 Veselin Topalov in that event), while Judit also tied for 1st in the 2011 European Championship, though she eventually took bronze behind Potkin and Wojtaszek on tiebreaks. If we allow speed chess into the mix, then Valentina Gunina’s brilliant 9/10 at last year’s London Super Rapidplay needs to be mentioned as well. 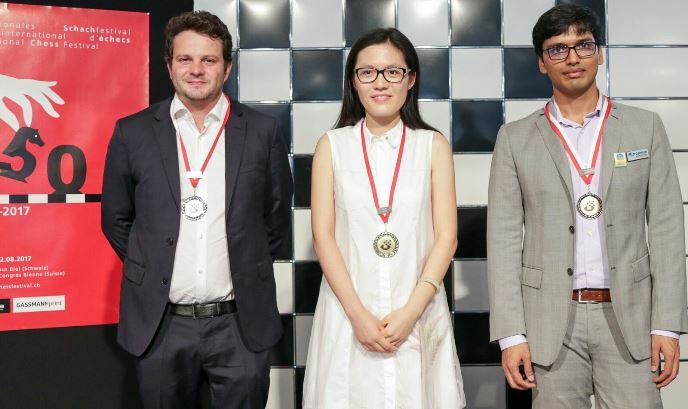 Praise flowed for Hou Yifan’s achievement. If you want the short version! 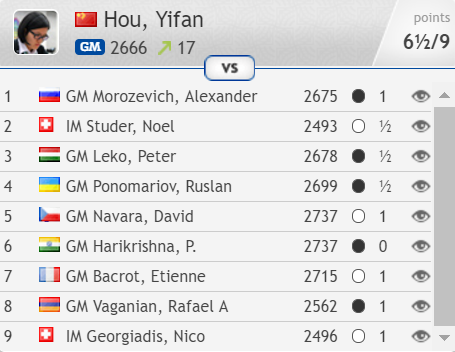 There are still only half a dozen players younger and higher rated than Hou Yifan, so let’s hope this is the start of a new rise! We’ll next see Yifan in action in the World Cup next month.